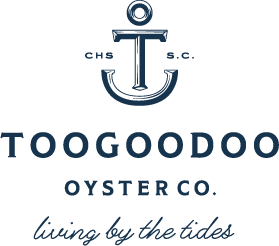 Our Story — Toogoodoo Oyster Co. This sparked an idea, and in January of 2016 the two decided to leave behind their businesses in Atlanta for a fresh start in the Lowcountry. Pregnant with their first child, they had been searching for a lifestyle change and place to raise their family. Moving to Charleston just felt right…like finally coming home. 2017 marked the spawn of Toogoodoo Oyster Company's first private label oysters—Toogoodoozies—and over the past year, with the help of an incredibly dedicated group of men and women, these oysters are finally ready to share with you. We hope you'll follow our journey as our farm and our family continue to grow!